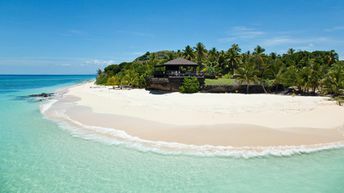 This beach ranks #2 of the "Best beaches in Fiji"
The only accommodation option in the island is a five star hotel Vomo Island Resort. Fly to Nadi International Airport (NAN). Get by taxi to the port of Denarau. Hotel boat will take you to the island. Any time of year. The greatest number of rains goes from December to April. The coldest sea water is from August to October.